Chauvet's SlimPAR 56 LED PAR lighting fixture is a simple solution for the complex problems that plague traditional incandescent PAR lights. Instead of unreliable gels that burn out mid show and only offer a single color, the SlimPAR 56's array of high-intensity red, green, and blue LEDs lets you create millions of color washes that can change and pulse with the beat. A low-profile design also lets you position the SlimPAR 56 in places too shallow for traditional par lights. And since LEDs produce very little heat, you won't crank up the temperature when you light up your stage or dance floor with Chauvet SlimPAR 56 PAR lighting fixtures. For most live music lighting rigs, the SlimPAR 56's built-in programs are all you need to add an exciting atmosphere to your shows. Chauvet loaded the SlimPAR 56 with an excellent selection of macros you can use, so you don't necessarily have to manage a DMX controller to put on a great display. And thanks to its built-in microphone and sound-activation mode, the Chauvet SlimPAR 56 can listen to your music and lock its tempo to the beat. You can even link multiple SlimPAR 56s together in master/slave mode to create impressive light shows with just the push of a button. Slim, compact, and lightweight wash that lets you create millions of color blends. LED technology provides high output without the heat or wattage of traditional incandescents. 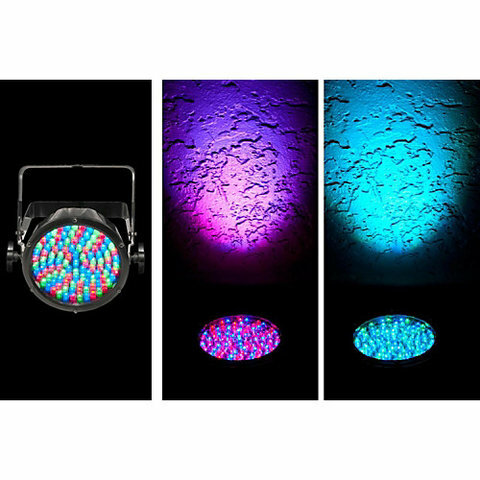 An array of 108 intensely bright LEDs (36 x Red, 36 x Green, 36 x Blue) lets you mix static colors, with or without DMX control. Built-in automatic programs add energy and variety to your shows. $74.99/each light plus tax per day!